Never let it be said Canadian currency isn’t colourful. Now one of our coins glows in the dark. 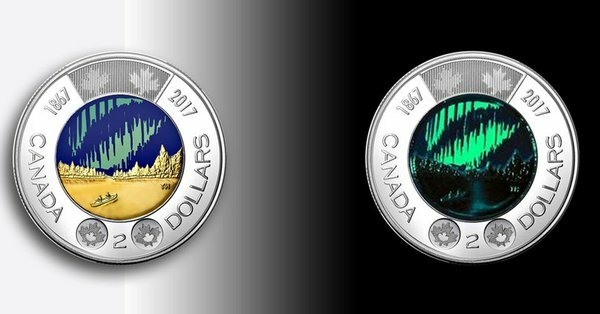 In celebration of Canada’s 150th anniversary of confederation, the Canadian mint has issued 3 million glowing Canada 150 toonies. The two dollar coin, selected from a national Canada 150 contest was designed by brothers Timothy and Stephen Hsia of Richmond B.C. Dubbed Dance of the Spirits, northern lights promise to glow in your pocket. Haven’t seen one yet, but when I do you’ll be the first to know if a coin can actually glow in dark corners.